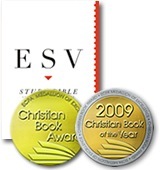 Die ESV Study Bible hat zwei Preise der Evangelical Christian Publishers Association bekommen und ist damit Bibel des Jahres 2008 und Buch des Jahres 2008. Wer einen Blick auf die Qualität dieser Bibel werfen möchte, kann sich hier die Einleitung zum Epheserbrief herunter laden: www..esvstudybible.org . Helen’s Church hat ein kurzes Video über Ostern produziert. http://www.st-helens.org.uk/easter/ <object width=“400″ height=“230″><param name=“allowfullscreen“ value=“true“ /><param name=“allowscriptaccess“ value=“always“ /><param name=“movie“ value=“http://vimeo.com/moogaloop.swf?… clip_id=4008816&amp;server=vimeo.com&amp;show_title=1&amp;show_byline=1&amp;show_portrait=0&amp;color=&amp;fullscreen=1″ type=“application/x-shockwave-flash“ allowfullscreen=“true“ allowscriptaccess=“always“ width=“400″ height=“230″></embed></object><br /><a href=“http://vimeo.com/4008816″>THAT’S EASTER Death to Life</a> from <a href=“http://vimeo.com/sthelens“>St Helen’s Church</a> on <a href=“http://vimeo.com“>Vimeo</a>.